i rememember being taken as a child into here at glasgow cross, the london road side if memory serves, the place was amazing, does anyone know what happened to the exhibits in there? i think the room that it used still exist above the furntiure shop that is in the building now. On the railway bridge there used to be a huge sign pointing to it. I don't remember it myself, but it might help to jog someones memory. I think it closed around 1984, there was stuff you could put coins into and they would move about, like laughing clowns, marching soldiers and music making machines and other weird stuff, no memory of go-go dancers unfortunatly. I don't reall the go go dancers but I remember the laughing policeman in the window . yeh i remember it, It had loads of stuff, clockwork in cases, trains moving. When the shop closed it moved to a smaller shop just round the corner. I wonder what happened to all that stuff? Someone must have it I hope. The only memory I have of the place was the little race track which constantly had cars going round it with no visible means of propulsion. It totally amazed me, stood there for ages trying to work out what made the cars move. I think it was part of the cash desk, I remember getting in everyones way as they were trying to pay for their goods. It was right beside the door to the stairs. I think that was the second floor. Remember the Corporation advertising buses started in the 70s? The first two were Barclaycard and Yellow Pages. There was also a Krazy House bus - I seem to remember it being purplish. Having read through most of the forum by now, I feel confident in confessing that I was a childhood bus-spotter. Catharsis in later life! Hurrah!! Are you sure this was at Glasgow Cross? Remember Krazy Kuts was at Glasgow Cross where London Rd and Gallowgate split. Schiehallion wrote: Are you sure this was at Glasgow Cross? Remember Krazy Kuts was at Glasgow Cross where London Rd and Gallowgate split. Last edited by DickyHart on Tue Jun 08, 2004 5:30 pm, edited 1 time in total. 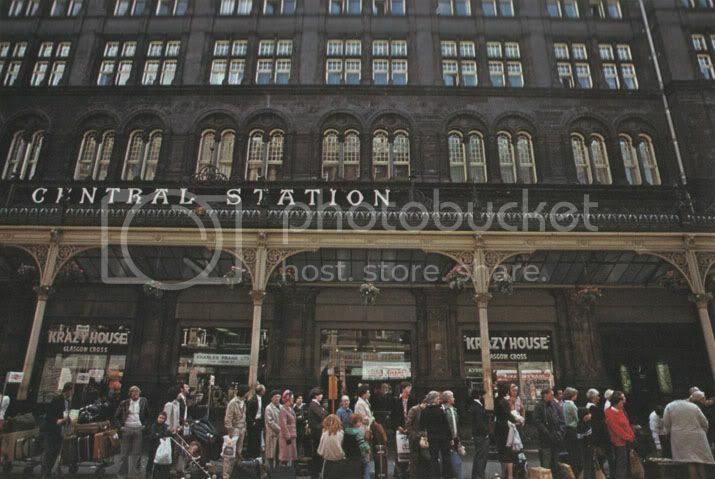 This is from a pic of St Enoch subway station just before it closed for modernisation in 1977. I've also got one from 1981 which was taken in Gordon St and seems to have Krazy House ads in the background. Full details of the book the pic comes from (highly recommended!) are in the original thread over in the Projects forum. The other pic I was talking about - this is from a 1981 book simply called Glasgow. It's a collection of pictures by Douglas Corrance, with text by Edward Boyd, long out of print but can still be found in charity shops and the like from time to time. This would appear to show that Krazy House took out ads in the window of the BR booking office in Central Station! I remember the crazy house and i can verify that the go go dancers were indeed there. I loved the place as a kid and have many happy memories of it.